The wine is now, without doubt, the most authentic ambassadors of Puglia in the world as capable of telling the history, culture and tradition of an area. It 'a story that fascinates, attracts, pushing more and more wine tourists to come in Puglia to discover the magic and beauty of our places. Just in the close relationship between production and places, among vines and territories lies the trump card dell'enoturismo. When talking about Italian wine very often come to mind the famous wines from Veneto and Friuli, the bunting over Po, the wines of Sicily or the famous wines of Abruzzo. 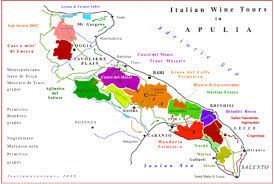 Yet many do not know that the region having the largest Italian wine production is laPuglia. In recent years, however, the situation has changed: some local entrepreneurs, some of the value and quality of their vines, they decided to enter the market alone. The basis of this decision, the desire to offer the public products derived from indigenous grapes, not found elsewhere and therefore unique: we refer to the Negroamaro, Primitivo, grapes of Troy, to Bombino black and white and the black Malvasia . Today Apulia has 25 wines with denomination of origin (DOC) with 128 different preparations: 52 red wines, 28 white, 22 pink, 17 sweet and / or liqueur and sparkling 9.